The series of 100 reached #76 with the completion of these images. 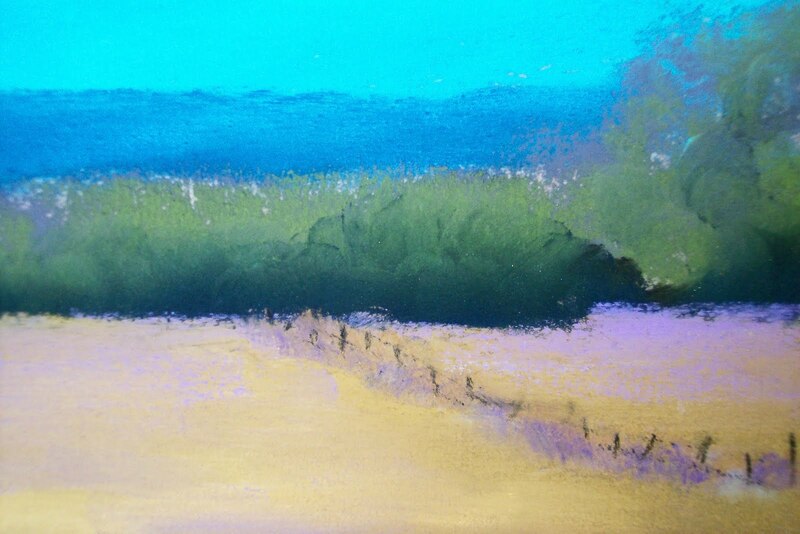 These were all done on the Wallis paper and random brands of pastels. I will try o finish up the next 24 within the month – hopefully before I leave for MT. 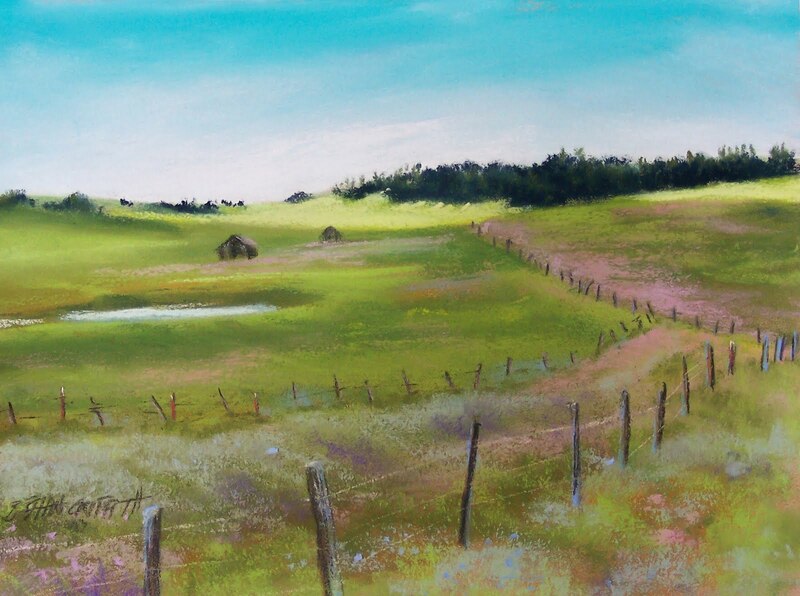 Moccasin Mountain Gallery wants some of the minis for their wall and I will take some more to Miles City with me. At the moment I am tacking the minis to a large foam core sheet, but not sure what I will do with the ones I don’t mat and frame. Maybe they will become a patchwork collage of little landscapes under one frame. At the moment I am working on my idea for the Quick Draw events; doing some sketching and drawing to see what I can fit into the designated time frames. It’s a challenge to complete a piece of work with a time frame as the guide. It requires planning and practice. 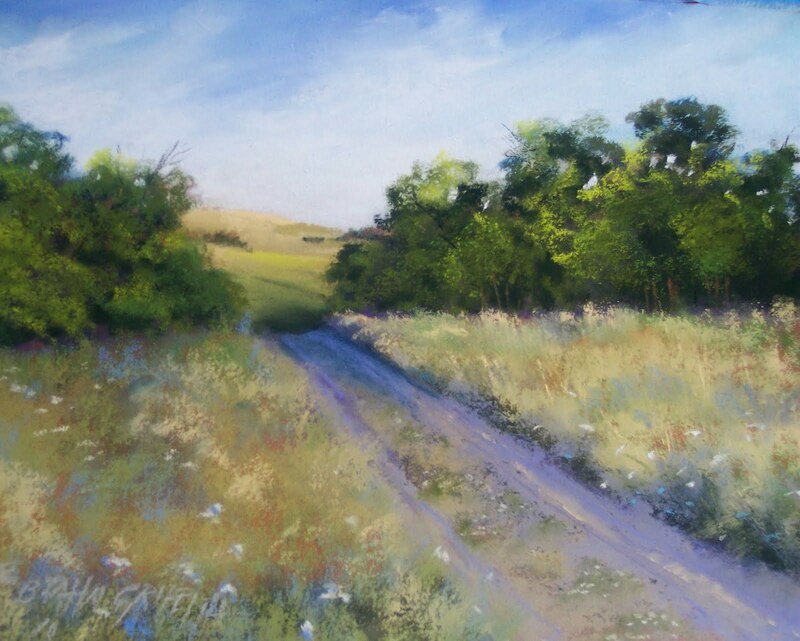 Not my usual style which sometimes entails spending some time painting, then going and making a pot of coffee, wait til it brews enough for a couple of cups and then pour out a hot, pretty concentrated rich cup of coffee…THEN go back and contemplate the paper on the easel! One must have already consumed their cup of brew before you start the Quick Draw and be ready to paint when the bell rings or the gun is shot…whatever the “start your painting” signal is! 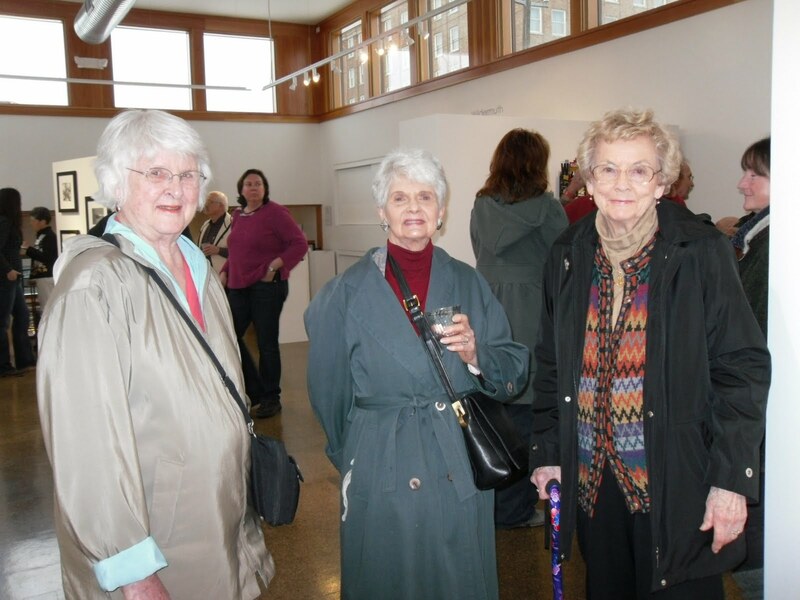 the Northwest Pastel Society member’s show opening was last Friday at Blue Horse Gallery in Bellingham. It was a nicely hung show with more than 100 pieces on the walls. Abstract was the preferred style of the judge and the piece “BC Chess” by Bill McEnroe was the best of show winner. It was a great piece to which Bill penned a poem as well. 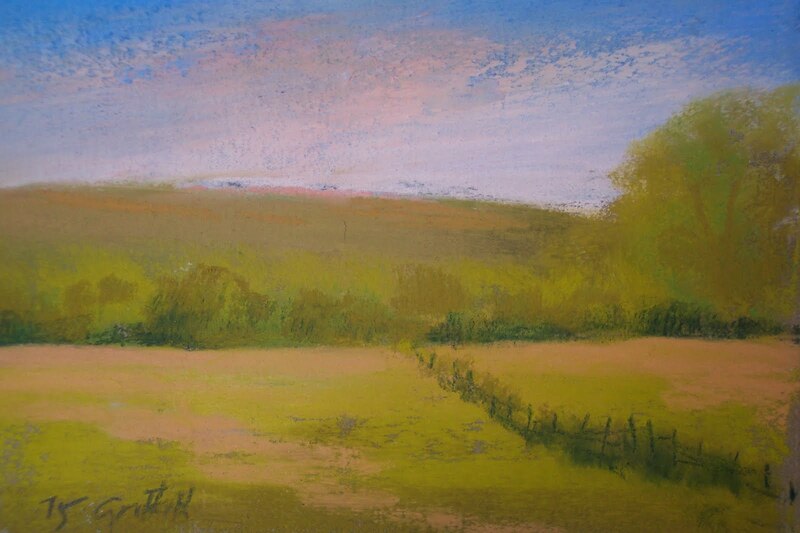 This painting as well as the other winning artists are listed on the Facebook Fan page Northwest Pastel Society and on the web site. This Facebook page is also a source for artists looking for pastel events in the Northwest – paint outs, competitions, meetings, etc. Good place to check where pastel shows are if you are a lover of the arts as well. Next weekend in Walla Walla is Spring Release for the wine industry. It creates quite a bit of energy with lots of people coming in to taste the wines of the valley. For artists, many of the wineries offer hanging space for art. These are generally lovely spaces and fun to hang your work in. I am considered a residence artist at Whitman Cellars, always having art hanging there and this year also have some pieces at the new Grantwood Winery. 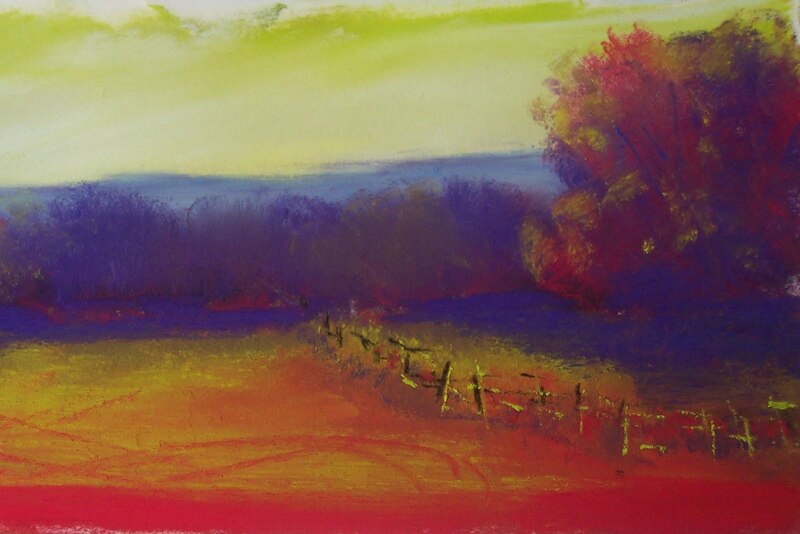 It is fun weekend to visit some of the wineries and taste some of the new releases and check out the art. with 140+ wineries, there are lots of opportunities to taste and view some art! So with that, I shall say happy painting…. Completing these 4 images brings me to 72 small works. 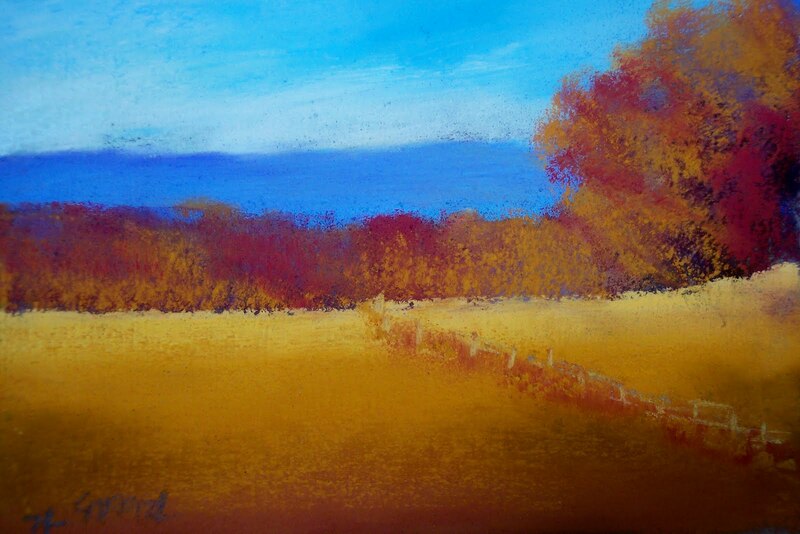 These were all completed on the Wallis paper with a variety of soft pastels and some Nupastels for detail. 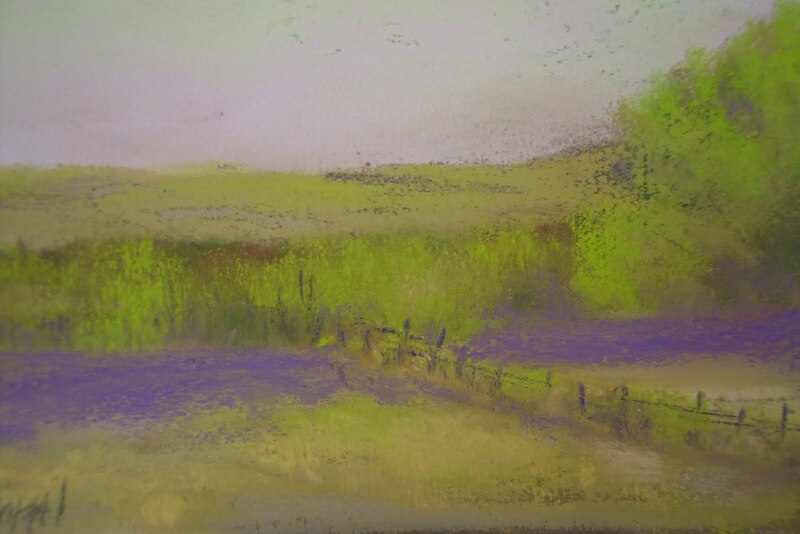 I attended the Northwest Pastel Society member’s show on Friday at the Blue Horse Gallery in Bellingham. The show was great – excellent variety and style to make an interesting show. Details of the show will be able to seen after the first part of May on the NPS fan page on Facebook and on the NPS website. Our board is now working on the International Pastel Show that we host – this year Nov-Dec at the Schack Art Center in Everett. The online entries are due by the 9th of August. The Schack Center (new)is being built now and this show should be the first in the new building! 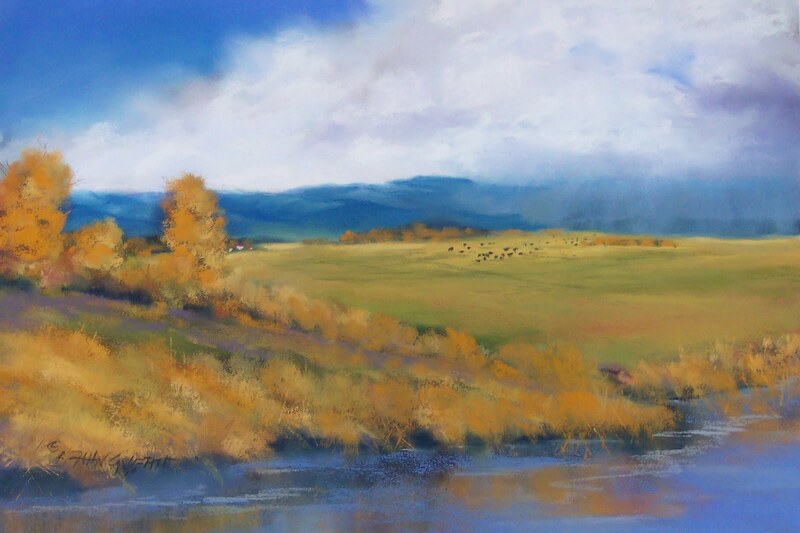 Encouraging pastelists from near and far to submit to this show as this will be a premier event, it is certain to draw lots of attendees from the Northwest. We are going to Montana in a few weeks and I will participate in a Quick Draw event. It is a very quick draw…1/2 hour to complete. I need to practice! I have in my mind what I am going to paint; now I need to perfect it…in a half an hour time! That’s a goal today – work on my “time trial”! My apologies for posting a photo image twice. don’t know how it happened or how to remove it :-(. 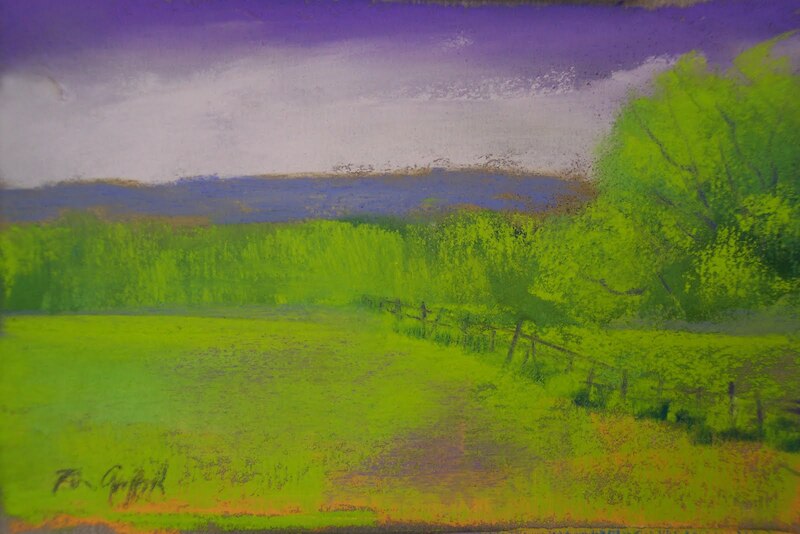 Some experimenting with black canson paper…found that the best pastels are the harder of the soft varieties like Rembrandt or the hard pastels like Nupastels. I used some limited palettes to create these. Using some workable fix in between layers helps build color on the Canson. It is interesting to see how the blue/red combination almost is looking like a photographic negative. 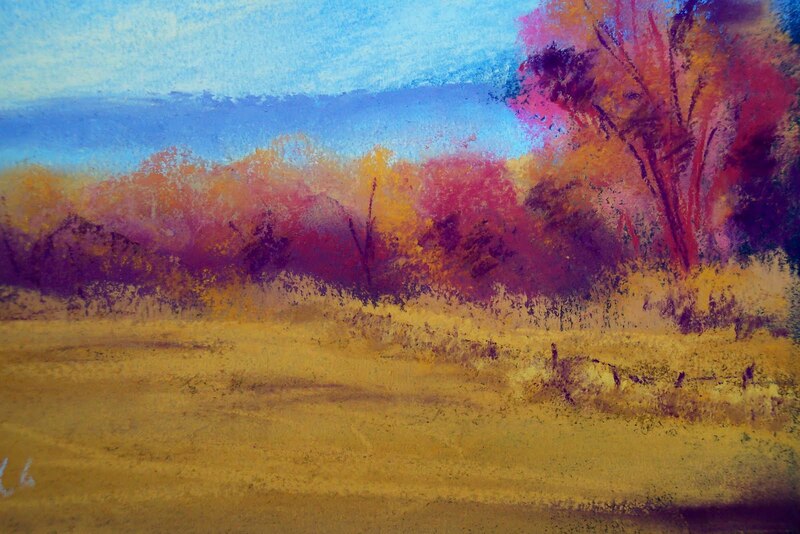 When you use a dark paper, one of the cool things is that the paper color adds a little texture when you let a hint of it peek through the pastel. 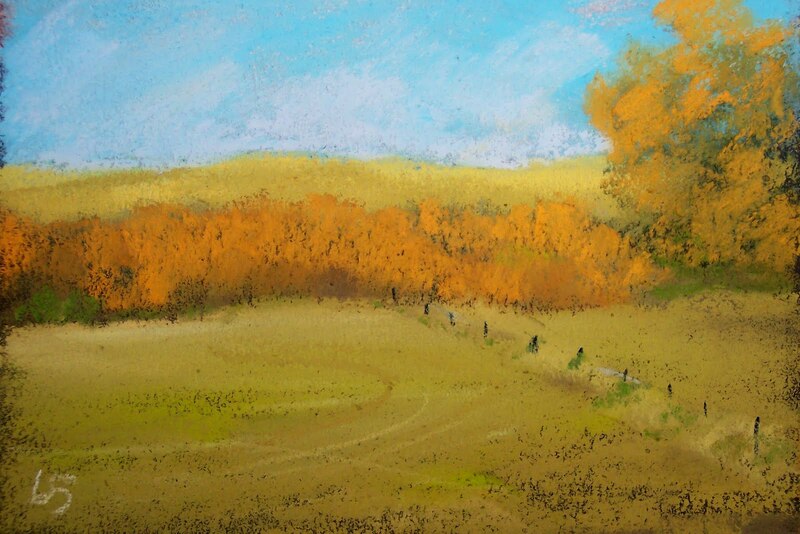 The little vertical piece was done on a scrap of Wallis about 3×4 inches and was a very quick little study with about 3 pastels. 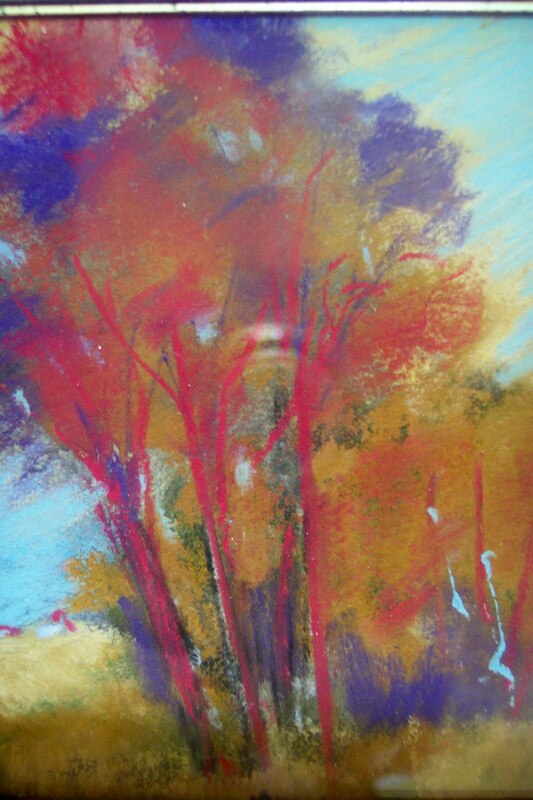 It is a good lesson to limit pastels to 3-5 sticks and see what you can do with that. I have just uploaded images on the Western Art and Architecture web site. This is a wonderful magazine for the reader who is interested in fine craft, art and architecture. Always good articles – focused mostly on western US life/art etc. There online site offers artists a place to showcase work and list their galleries and events. 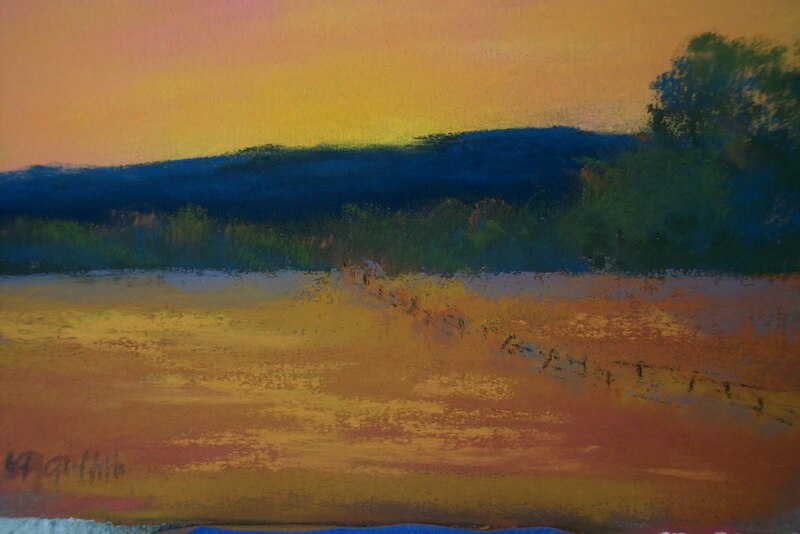 The art is not all western – nice variety of realism, abstract and impressionistic…and lots of different mediums. Check it out. There is nothing like the spring skies when the days are hot and then late in the day the storm clouds come in. Here the storms come from the west typically and you can see them coming a long way away…from the Pendleton Blues the sky grows darker and darker. 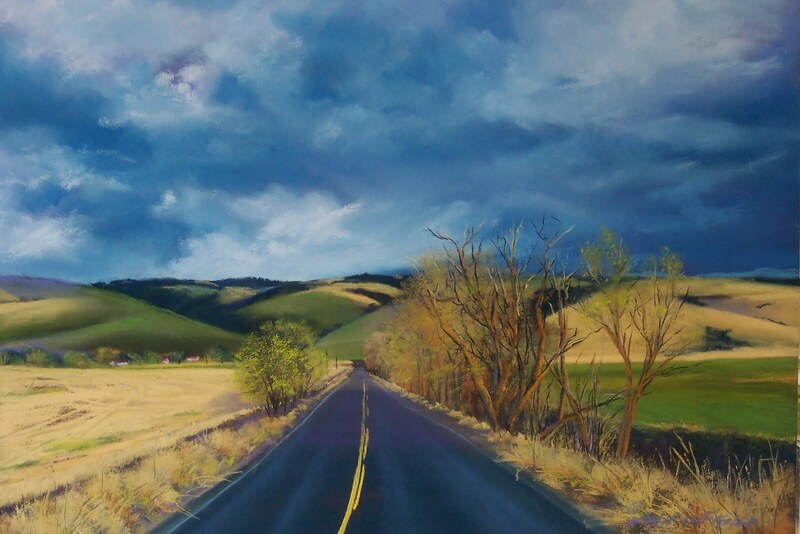 so a lot of painitngs I do of the Blue Mountains with stormy skies, you can see the storm coming from the west…And that was the name of a painting I did for the Pendleton Center for the Arts show a couple of years ago. 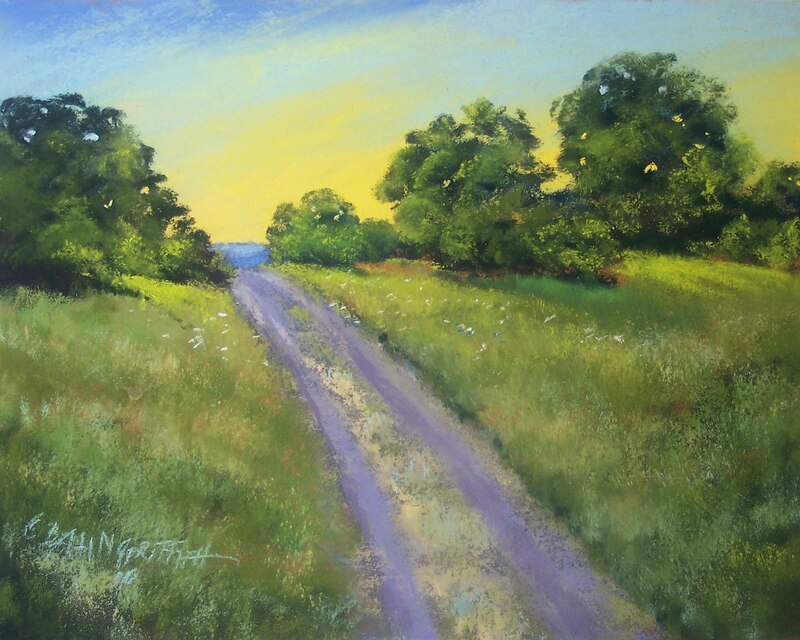 One painting posted today, of the highway heading toward the mountains is the old Immigrant Road that takes you to to St Andrews Mission and then circuitously up the mountains to the top of Cabbage Hill on I-84. It’s a great spot next to the mountains where the mission sits. The mission school is now the Crow Shadow Institute of the Arts where some absolutely incredible print making takes place under the direction of Frank Jenzen…it’s where I learned about monoprints and some basic printing skills. 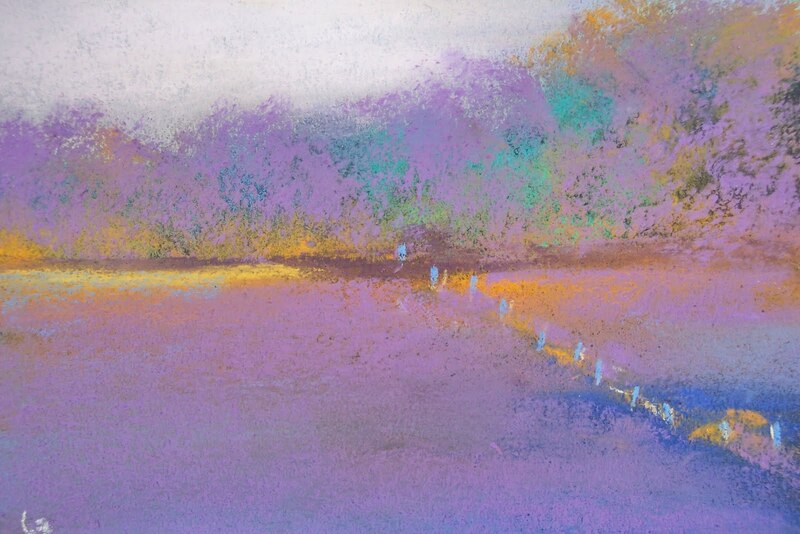 A day yesterday was spent at Bennington Lake, painting with Carlyrae, John, Jeff and Mark – bunch of pastelists who share the love of plein air painting and just getting out and having some good conversation and painting. happy painting and enjoying the beautiful spring! One more in the series of 100 is added using a lot of reds and purple. I did one more tiny sketch on a scrap piece of Wallis that is about 3×4 inches; maybe smaller…very simple just trees with the purples, reds and orange hues. I liked it enough to put it in a tiny little frame. No image of it yet. I am workingon some pieces to go to Big Fish in Bellingham the end of next week and ones for Kelly’s in Joseph as well. I have a couple of larger ones completed – photos on the next post. 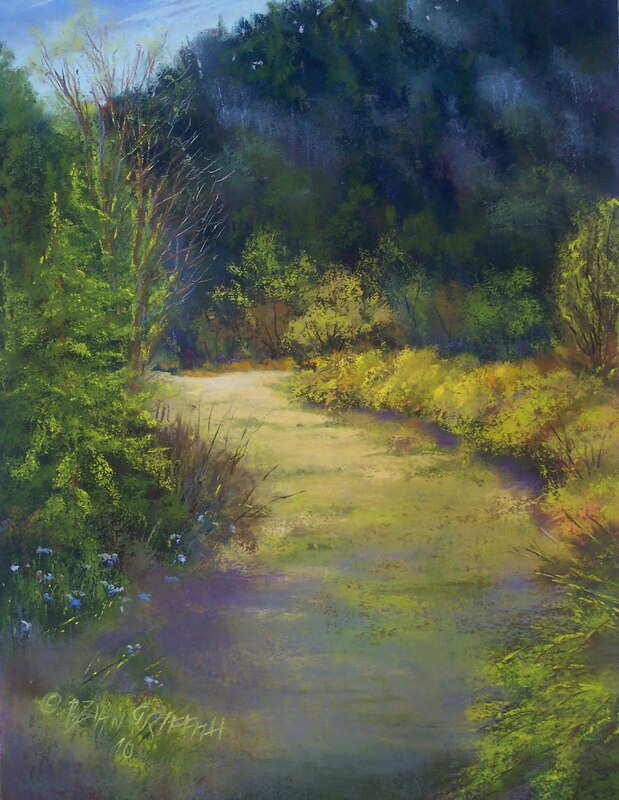 I grumble a little at myself – when I am working small it is so much easier to be nice and loose with the pastel; but when I work large, the painting takes on a more realistic appearance. Maybe I need to work with my left hand only! I included a couple of shots of the Willow show on this post. It was a very nice evening and just looking at them again brings good memories of a very fun show with all the variety of 5 different artists! The 60-something mini is posted as well as a new piece that I am pretty happy with. I used a reference photo from my trip to the Oregon coast in mid March. The Cafe Utza show is hanging. If anyone ventures into southeastern Montana into the burg of Miles City, a must do is having coffee and pastry at Cafe’ Utza. You get a dynamite, bold brew and some wonderful pastry of the day and then on their rich red walls they hang art from cables. 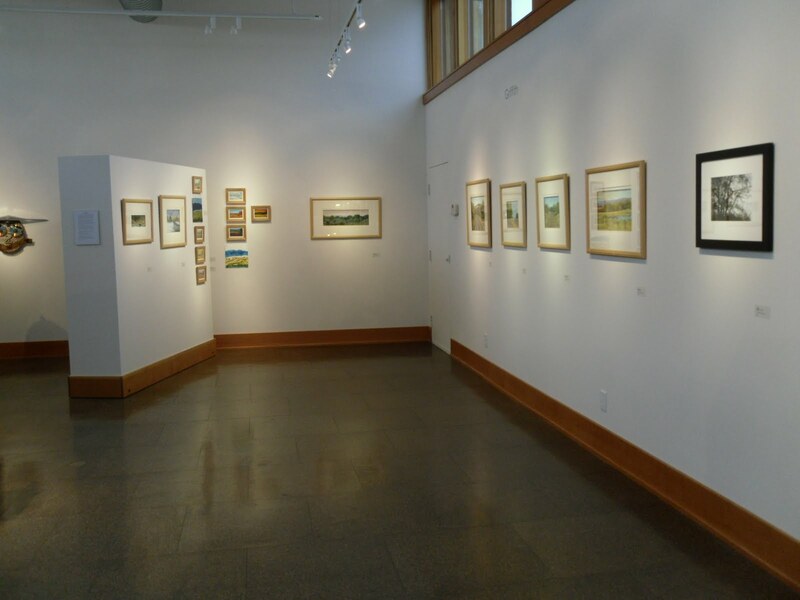 Several of the minis and some larger landscapes are hanging there for next couple of months. My son Chris is a banker in Miles City and found this little gem of a coffee house and since he is the self proclaimed “art marketer”, he set up the show! Next month we will go to MC to do an art event sponsored by the Art and Heritage Center there…a quick draw…and it is the quickest of quick draws. One half an hour to complete a painting/drawing and another 10 minutes to frame it. I love a challenge! Trust me that my paper will be no larger than 9×12 inches! 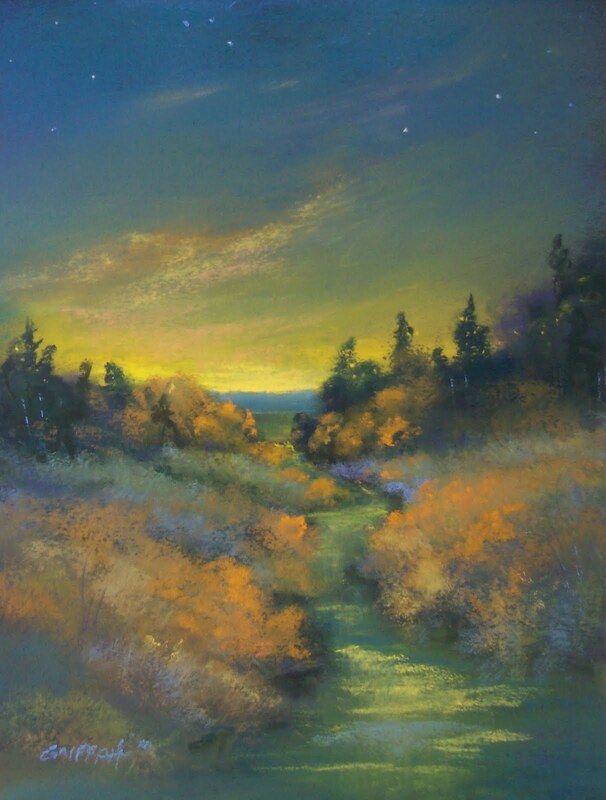 If you haven’t already, check out the fan page “Bonnie Griffith Landscape Artist” on Facebook…also another fan page is the Northwest Pastel Society page…that’s one that will post shows, meetings, events, etc for the NWPS. 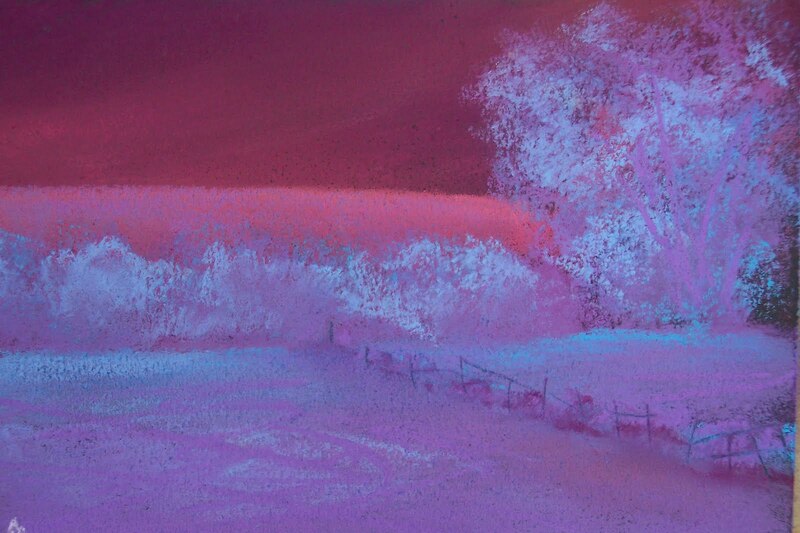 Anyone interested in and working in pastels might find this page worth a book mark as well. More minis are brewing…the pastel dust is accumulating! The pastel dust is alive and well at my studio! I however, have not been working on my series of 100 in the last week or so. There were some other time challenged issues that needed attention, so the series got put on the back burner! I am working on pieces to go to several galleries. The two I posted will probably to to opposite ends of the state! First of all, the Willow Gallery opening was great. The evening was a blustery, rainy and cold one, but it did not seem to deter art fans from getting out. I loved seeing some of my former, fellow board members from the Carnegie Art Center – Sheila, Cheryl, Molly; as well as Charles Potts a respected poet/writer; a lot of friends as well…The show is diverse and interesting; worth a trip in to see! I loved Candace Rose’s assemblages – most unique and interesting and Kathy Wildermuth’s watercolors are stellar…(Les bought one and it will look great with the one of Kathy’s that I already have!). Susuan How one of the photographers exhibited her work that were all of the Bennington Lake area. I have loved that area and it has been the source of several trips of mine with my camera. 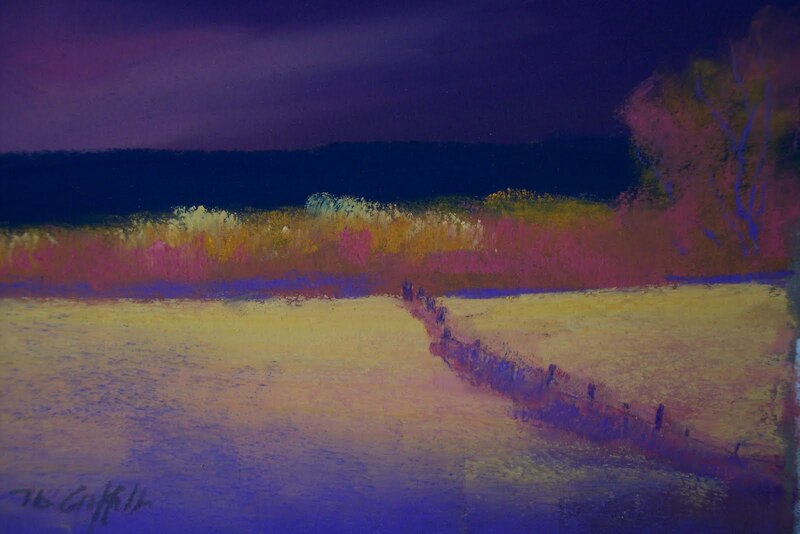 Anyway, that was an inspiration to go through those photos of mine and do some pastels of that area. The ones attached to this post are of the trails by the lake. 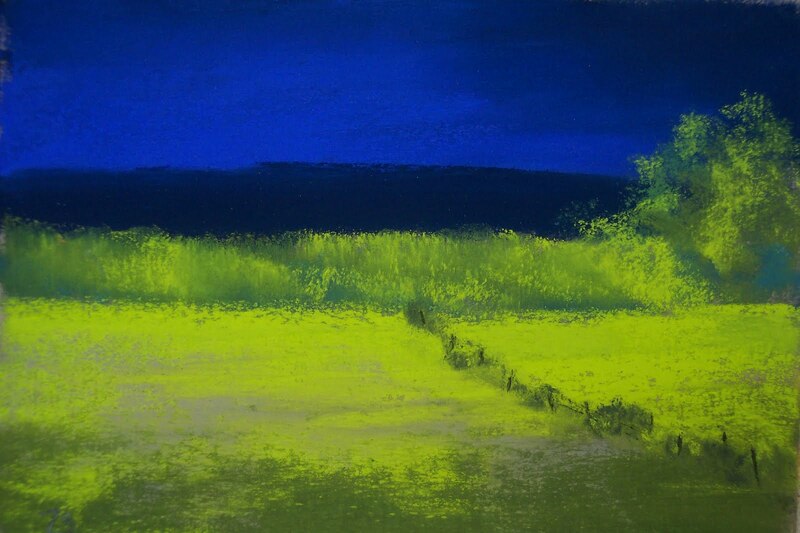 I will do more; it is a most interesting landscape.